Not too long ago, we had home theater PCs (HTPCs) that were fairly huge, had high noise emissions, and weren’t really suited for multitasking. Now, we are having ultra-compact Mini PCs that not only look good but also are silent and versatile. 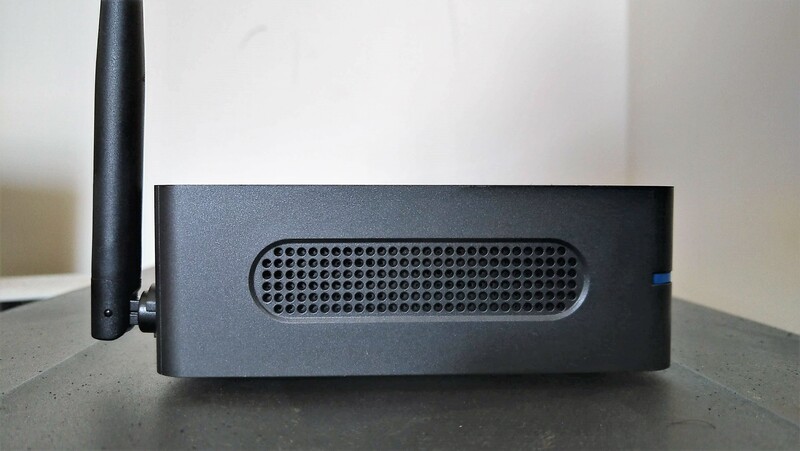 One such product is Azulle’s Byte3 Mini PC. 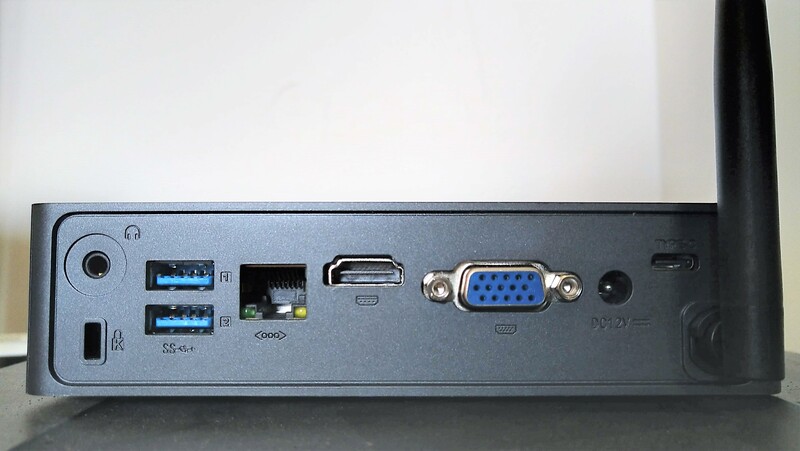 The Byte3 Mini PC is in many ways analogous to the Access3 Mini PC Stick in terms of functionality but is modeled on the lines of the Intel NUC kits. This gives the Byte3 advantages in terms of better thermal performance and a better port selection. The Byte3 is not a powerful Mini PC, but it gets a lot of things right that make it a good companion for those looking at a cheap HTPC setup that can also be used for the occasional productivity task or even light gaming. Given the low-power specifications, does the Byte3 offer the required performance to be a versatile all-rounder? Let’s find out in this review. Before we move on, here’s a quick rundown of the Byte3’s specifications. You can also choose from additional RAM and storage options on Amazon or on Azulle’s website. The Byte3 is pretty compact and sports a functional design aesthetic. There aren’t any LED indicators on the device except for the power button with the Azulle logo glows blue when powered on and red when on standby. Like the Azulle Access3, the Byte3 also has a multi-directional external antenna that helps with better signal reception. On the front, there’s the Power button and an IR window. On the front, we have the power button and an IR receiver window. There is a blue strip that runs along the middle but it is only the power button that is illuminated. Ventilation grill on the left. On the left, there is a vent for cooling. Although fanless PCs are great due to their zero operating noise, we feel Azulle could have put the vent to good use by including a fan for the CPU so that it can sustain boost clocks for more longer periods. SD card slot, USB 3.0, and USB 2.0 ports on the right. Towards the right, we have an SD card slot that can take cards up to 250 GB, a USB 3.0 port and a USB 2.0 port. The back of the device offers good port selection. 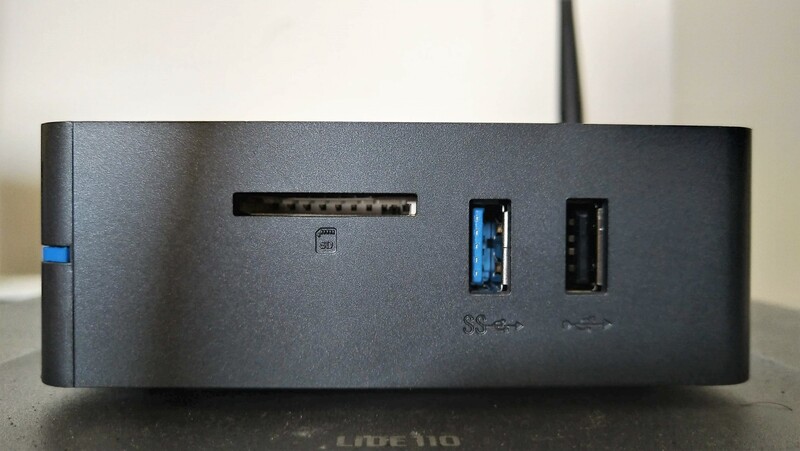 The back of the device offers a very good selection of ports that include two USB 3.0 ports, one USB Type-C port, one VGA-out, one HDMI-out port, a 3.5 mm combo audio jack, and a Kensington Lock slot making this device very versatile when it comes to connectivity. The included IR remote works well for multimedia apps. Couch potatoes will be happy with the included IR remote that can control basic tasks like volume, settings, power, menu, etc. The remote is cumbersome to use for regular Windows functions but comes in handy while using multimedia apps such as Plex or Kodi. PCB showing spare M.2 slot, SATA power, and data cables, and soldered Intel Wi-Fi card. Unlike the Access3, the Byte3 can afford a bit of modularity. The CPU and RAM are soldered onto the PCB, but there is a spare M.2 slot and a SATA port with necessary cables included. 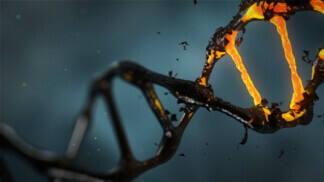 This helps in adding significantly higher and faster storage. Bear in mind that the M.2 is not an NVMe PCIe slot so you will get only SATA speeds. You can also add a traditional 2.5-inch SATA SSD/HDD if needed and Azulle has included the necessary power and data cables within the device itself. The back cover has a holder beneath that can firmly grip the 2.5-inch SATA HDD or SSD. Overall, the design of the Byte3 is clean, minimalist, and functional. The top part of the unit has concentric striations that look good and give a sense of sophistication to the design that should complement any decor. The best part is that you can also optionally install a VESA-compatible back plate to mount the Mini PC to the back of your display and hide it from sight. The Azulle Byte3 Mini PC comes pre-installed with Windows 10 Pro. Our test device came with the Windows 10 Pro April 2018 Update (1803). Azulle is yet to offer the Windows 10 Pro 1809 image on the website so before running the benchmarks, we manually updated the device to the latest Windows 10 Pro October 2018 Update (1809) using the Media Creation Tool from Microsoft. We also ensured all device drivers are up to date including those for graphics, Wi-Fi, Bluetooth, and LAN. There weren’t any new BIOS updates available from Azulle at the time of this writing. 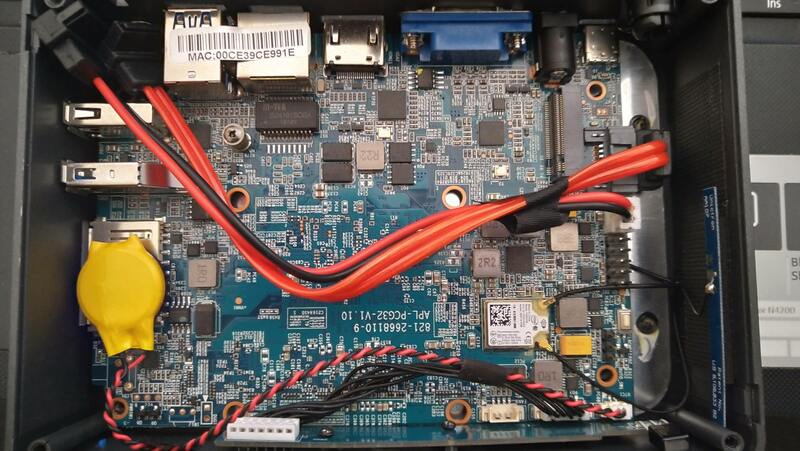 The Byte3 is powered by the Intel Celeron J3455 quad-core CPU that comes under the Apollo Lake family. The Celeron J3455 is ideal for low-cost devices targeted at simple workflows and is fabricated on a 14nm-FinFET process similar to Intel’s Skylake and Kaby Lake CPU families. The Celeron J3455 works at a base clock of 1.5 GHz and can boost up to 2.3 GHz under load. The low TDP of 10W means that OEMs can use this CPU in fanless designs but expect to throttle under load due to passive cooling. The Celeron J3455 generation comes with the integrated Intel HD Graphics 500 GPU that features 12 execution units and up to a 700 MHz clock. The Intel HD Graphics 500 offers native H.265 decoding support for 8-bit color depth videos and can connect up to three displays via HDMI or DisplayPort. The Byte3 Mini PC comes with only 32 GB of onboard storage of which around only 18 GB is available to the end user. Therefore, not many programs can be installed concurrently. There isn’t any bloatware on the device but quickly installing a few programs can pop up the low storage warning. We evaluated the CPU, GPU, and storage performance of the device using a set of select benchmarks to get an idea as to what the Byte3 is really capable of. We also compared the scores to the ones in our Access3 review wherever possible to see how these two Mini PCs stack up. Cinebench is a good benchmark for measuring single-core and multi-core CPU performance. The Celeron J3455 in the Byte3 managed to score 49 points in single-core and 173 points in the multi-core test. 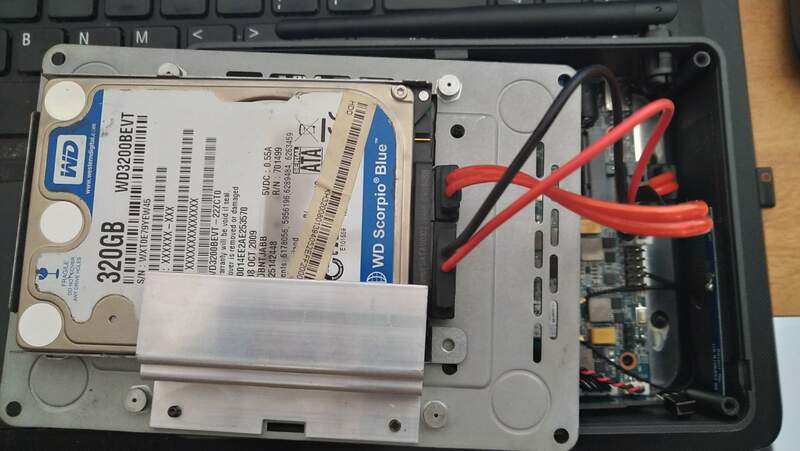 This is lower than the Celeron N4100 in the Azulle Access3 that scored 67 and 205 points in the single-core and multi-core tests respectively. The scores are similar to what is expected of this chip and are comparable to a Core i3-4010U CPU from 2013 that scores about 65 points in single core and about 163 points in multi-core. For the end-user, this means you will have enough power to do some light multitasking of productivity apps such as Office and email. You should also not be having any issues in running multimedia apps such as Hulu, Netflix, Plex, or Kodi. Pushing the system any further will result in perceivable lag. The Byte3 is also not suited for running apps such as Photoshop or complex video/audio editing software. 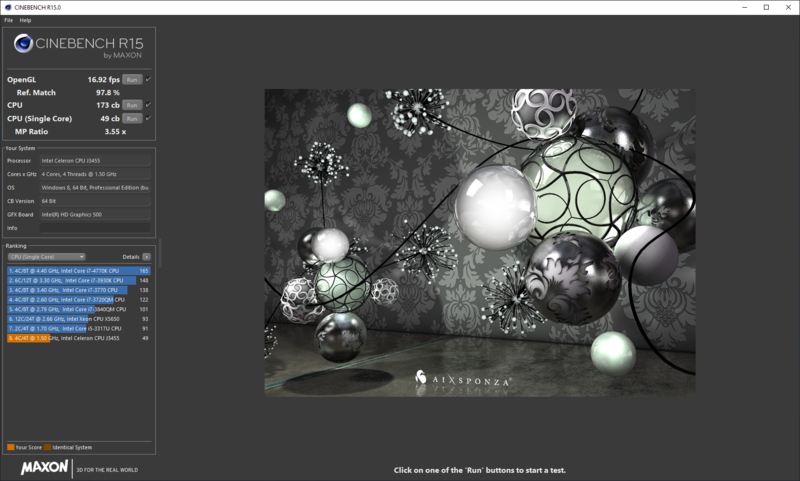 For evaluating the GPU, we ran a few benchmarks in the 3DMark suite. 3DMark contains multiple benchmarks tailored towards different devices so we chose to run the Cloud Gate, Fire Strike, and Ice Storm Extreme tests taking into account the specifications of the device. 3DMark Cloud Gate is a test for notebooks and common home PCs that have GPUs supporting DirectX11. The test is run at 720p and includes both physics and graphics scores. The Byte3 managed to score 2,934 points, which is higher than the Access3’s Intel UHD Graphics 600 that scored just 2,821 overall points. Fire Strike is more tailored towards gaming PCs. The Byte3’s score of just 389 points helps underscore the fact that the device is not tailored for gaming. However, you can just about manage to run some titles such as CS: Go and DOTA 2 provided you lower the resolution to 720p and set the graphics details to low. 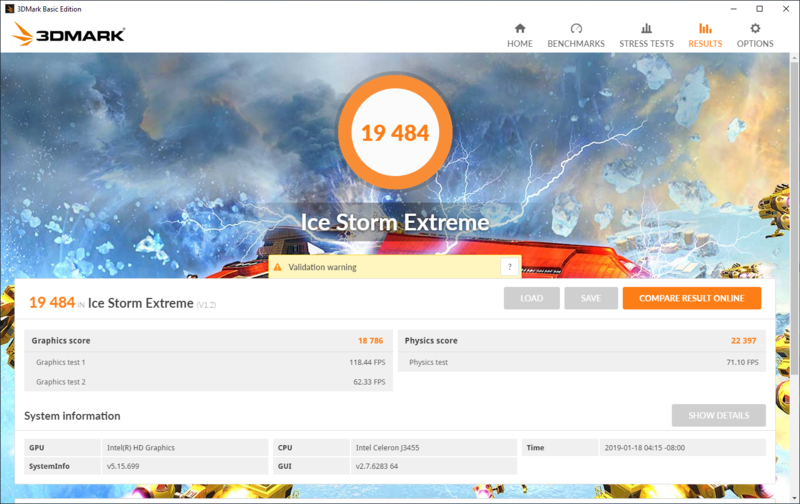 Ice Storm Extreme scores were good and the Intel HD Graphics 500 has managed to score 19,484 with good FPS scores in the graphics and physics tests. Overall, we see that the Intel HD Graphics 500 seemed to have scored better than the UHD Graphics 600 in the Access3 despite the latter being a much-improved GPU. This could be due to enhancements in the latest drivers at the time of this review and we expect to see similar score boosts with the UHD Graphics 600 as well with updated drivers. The integrated graphics in the Byte3 can do a fine job at decoding 4K60 video without stutters. However, if the 4K video is of a very high bitrate or if it is encoded with multi-channel HD audio, expect to see some frame loss during video decoding. But this shouldn’t be a concern if you are more into video streaming than local file playback. Games are out of the question unless you are really willing to play at low resolutions with low graphic detail. Simple games from the Windows Store and Steam or AAA titles from quite a few years ago should be able to work, though. PCMark is a popular benchmark to simulate common productivity workloads and evaluate the performance of the device is handling them effectively. It is categorized into Essentials, Productivity, and Digital Content Creation tests and runs a suite of programs to mimic daily tasks such as video conferencing, photo retouching, word processing, spreadsheet data, and more. Scores are calculated for each category and an overall score is arrived at. 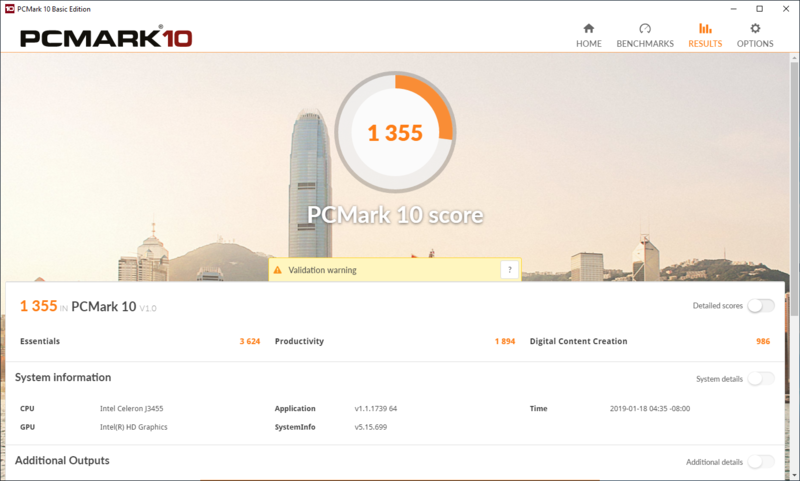 The Byte3 managed to get an overall score of 1,355 in PCMark 10. The Access3, on the other hand, was better at having scored 1,624 points. In individual categories, the Byte3 managed 3,624 points in Essentials, 1,894 points in Productivity, and 986 points in Digital Content Creation. We think the lower scores could also be due to the fact that the CPU is passively cooled and can easily throttle under load. A provision for a simple heatsink-fan assembly could have probably helped the Celeron J3455 in posting slightly better results. That said, the scores aren’t too shabby for a CPU of its class and daily workflows such as browsing the web or Office work should not have any serious impediments. However, since the RAM is limited to just 4 GB in our unit, the lags become apparent as soon as you start opening multiple browser tabs or multitask with memory-heavy programs. Therefore, we recommend opting for the 8 GB RAM variant if your budget allows. Our Byte3 unit came with 32 GB of eMMC storage onboard. You can also configure it with 64 GB of storage if needed. 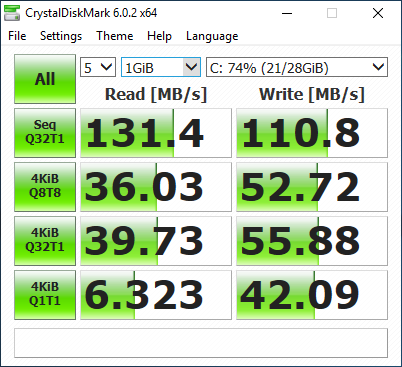 Although eMMC is flash-based, it is still not as fast as a traditional SSD and the score below prove it. The eMMC in the Access3 sports sequential read speeds up to 131 MBps and sequential write speeds up to 111 MBps. Thee scores are somewhat lower than what we saw in the case of the Access3 but this is to be expected. Not all flash-storage are made equal and even those in the same class tend to show variations in read and write speeds. File copy speeds are fairly okay. There is one advantage in the Byte3 that we recommend every user to make use of — the ability to add additional storage. You can add a 2.5-inch SSD or even a high-capacity laptop HDD to the SATA port or an M.2 stick SSD to the M.2 port. Doing so will give you an immediate boost in overall productivity in tasks that aren’t too CPU-reliant. You can add an additional SATA SSD or HDD to the Byte3. 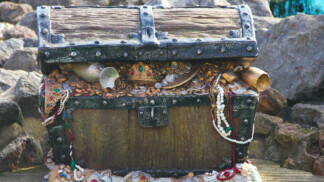 Not adding additional storage can quickly prove to be irksome as the free space on the eMMC storage is paltry. It will also pose issues when you fill up the main RAM as Windows writes the paging file to disk and accessing the page file will be slower due to the low speeds of the eMMC. Therefore, we strongly recommend going for an M.2 or SATA SSD (or even both) and set the page file location to that drive for peace of mind and fast performance. The Azulle Byte3 offers a very good experience for the casual home user who doesn’t have powerful computing needs. 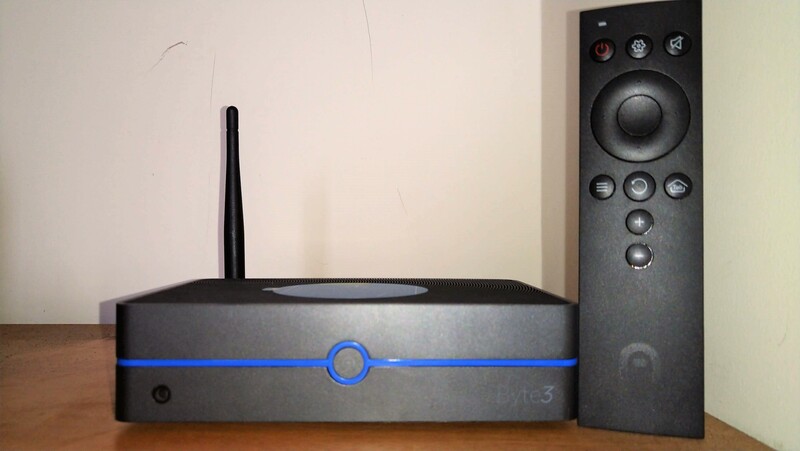 With the inclusion of the sparsely featured yet convenient remote, the Byte3 is great for those wanting an HTPC setup without the trouble of having to configure a bulky rig. Availability of full Windows 10 Pro offers the versatility of a PC whenever you need to get some quick work done. Gaming is not the Byte3’s forte but the casual gamer is taken care of. Windows Store games such as Asphalt 9 and Modern Combat work well and so do games like Age of Empires: Definitive Edition. However, do not expect modern AAA games to run well even at 720p low settings. Wireless performance is excellent and the Intel Wireless AC 3165 chip offers both 2.4 GHz and 5 GHz support. The wireless module is soldered so you cannot swap out the card for something more powerful but then, that is not the target use case for this device. The Byte3 could easily hit the 50 Mbps mark when connected to the Wi-Fi hotspot, which is the maximum speed offered by the ISP. 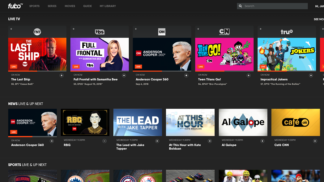 For general web-browsing, Microsoft Edge is a better alternative than Google Chrome if you are more into streaming services such as Netflix or Hulu. Edge has the advantage of being intricately woven into the OS so it can make good use of GPU acceleration in a better way compared to third-party browsers. It is also light on system resources and is directly secured by the built-in Windows Defender software. That said, most Google sites such as YouTube work best only in Chrome or a Chromium-based browser so we’d suggest using a mix of both depending on the service you use. Due to the low memory in the base variant, opening multiple tabs in any browser can get taxing depending on how heavy the page is. With respect to emissions, we noticed that the Byte3 Mini PC does tend to get warm when stressed or even under normal continuous use. Luckily though, the temperatures aren’t too high but as mentioned earlier, Azulle could have easily incorporated a low-decibel fan to help with the thermals. The included I.R. remote works well across sufficient distances and it is powered by a conventional non-rechargeable CR2032 Lithium battery. It is not as fully featured as the optional Azulle Lynk remote but works well for navigating multimedia apps. Navigating the Windows UI is, however, a pain although you can still access the Windows Start menu, Settings page, and put the device on standby with just a press of the button. While the remote is a handy feature, you still need to be in the line of sight of the device for it to work. A Bluetooth remote would have been much more useful. 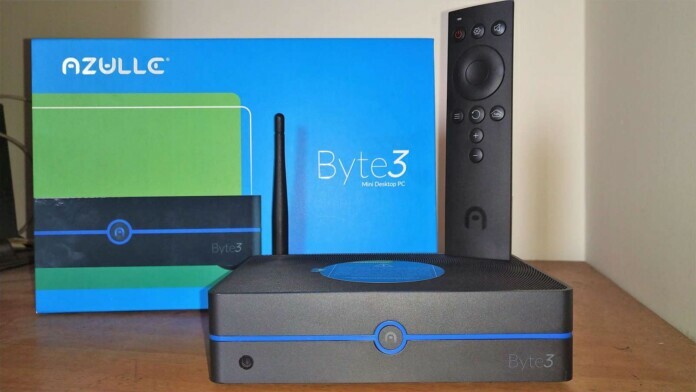 Overall, the Byte3 is great as a home entertainment Mini PC that still offers the flexibility of running traditional desktop programs if needed. The Azulle Byte3 retails for around $240, which we feel is a good price for the features on offer. Assuming that you already have access to a TV or monitor with an HDMI port, you would only need to factor in a few additional peripherals such as a wireless keyboard and mouse along with a microSD card or an SSD for storing data and programs. Azulle offers a one year warranty on the Byte3 and you get a variety of customer service options such as live chat, telephone, and email. The Azulle website also provides the latest software and driver updates, but we felt that the product support page could be a bit more detailed. We also think that Azulle should include instructions on how to add additional storage for those who aren’t too tech savvy. The Azulle Byte3 Mini PC offers a versatile home entertainment solution that gets the basics right without breaking the bank. That said, it is important that you decide if it fits for your use case. We think this is a great device for video streaming from a NAS or even web services. It can even serve as a thin client for running programs on the network or as a download box if you add extra storage. The good port selection is a welcome aspect that further enhances the Byte3’s connectivity. Is there scope for improvement? Surely. For one, we felt that Azulle should have used a much more capable CPU in the Byte3 given its fairly roomy interiors. A passively cooled Core M would have been much more useful than a Celeron. A cooling solution would have been extremely helpful with the thermals as well. 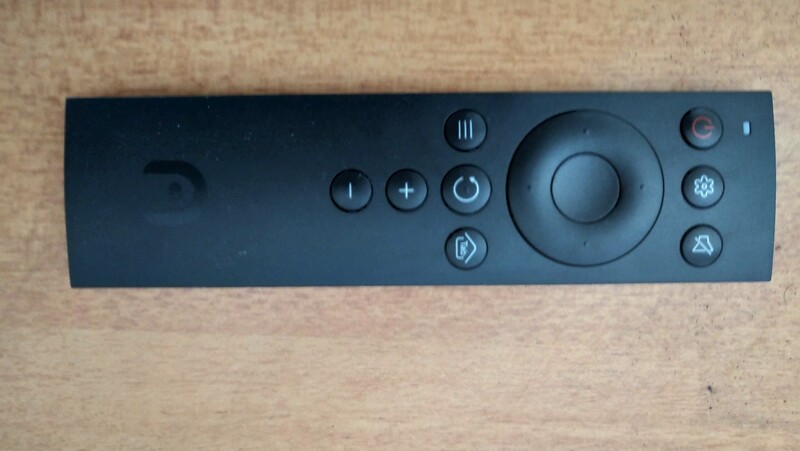 The remote control could have been Bluetooth capable instead of the aging IR standard. That would have alleviated the line-of-sight requirement and also made it more versatile such as the ability to process voice commands. 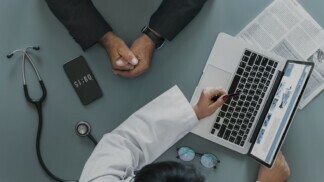 As mentioned in our Access3 review, Azulle should explore the possibility of offering ARM-based devices. This will further reduce the overall footprint of the device and also make it much more energy efficient. If you are looking for a compact HTPC or thin client solution that can also accommodate the occasional productivity task or two, the Azulle Byte3 is a very good option to consider. 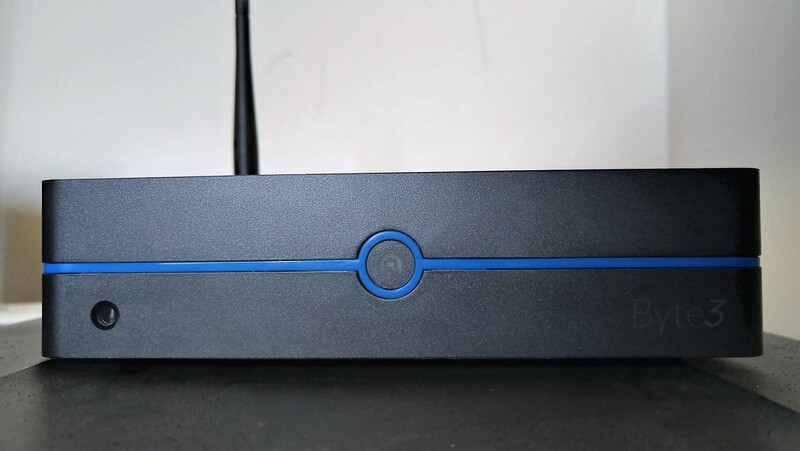 That wraps up our review of the Azulle Byte3 Fanless Mini PC. We hope that this review could give you a glimpse into the design and performance of the product and also help you decide if it’s worth your money. If you have any questions, feel free to let us know in the comments below and we will get back to you as soon as possible.